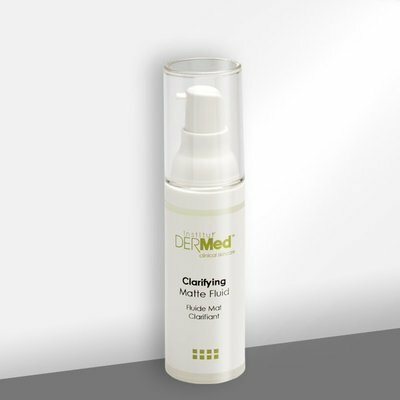 The Institut' DERMed Clarifying Matte Fluid formulated with Grapefruit Peel Oil and Phytic Acid to help restore moisture balance for a clear, clean complexion. A serious oily/acne prone skin hydrator formulated without: parabens, mineral oil, sodium lauryl sulfates, phthalates, artificial dyes or synthetic fragrances. Products not tested on animals. Recommended for excessively oily skin. Smooth onto the face and neck with finger tips until absorbed. For best results, use twice daily, morning and evening. For added protection during the day, follow with the Institut' DERMed Brightening Moisturizer. Grapefruit Peel Oil - a rich anti-oxidant high in flavonoids and vitamin C, to fortify the skin. Phytic Acid - derived from the brans and hulls of most grains, beans, nuts, and seeds used to brighten and maintain an even skin tone. Aqua (Water), Alcohol Denat., Hamamelis Virginiana (Witch Hazel) Water, Glycerin, Deoxycholic Acid, Hydrogen Peroxide, Carbomer, Lonicera Caprifolium (Honeysuckle) Flower Extract, Lonicera Japonica (Honeysuckle) Flower Extract, Xanthan Gum, Citric Acid, Aloe Barbadensis Leaf Juice Powder, Citrus Grandis (Grapefruit) Peel Oil, Phytic Acid, Vitis Vinifera (Grape) Seed Extract, Sodium Hyaluronate (L), Potassium Sorbate, Limonene.